After the last post on batteries, Dave asked a really good question: How does one get started? Other questions were raised as well; How to you justify the cost of the charging infrastructure? How do you determine charging/cell capacity? Good questions, all and I will attempt some answers. First, some history. When I first started using rechargeable batteries, we were using 8-10 wireless mics on stage every week. So, I bought 20 charging slots and 40 batteries. I figured I wanted to have enough slots and cells on hand to have a complete set charging at all times. We then changed our batteries between rehearsal and Saturday night service, and between the two Sunday services. That worked well, and we never had a battery go down on us, save the times we forgot to change them. That was also using a 9v infrastructure. I think my initial investment there was a bit over $300, which was a huge savings considering we were spending $20/week on disposables. Fast forward to today. We are now running 6-8 wireless mics a weekend, all using AAs except our pastor’s UR1M which uses AAAs. I just placed an order with Thomas Distributing for three Maha MH-C800S chargers with 8 slots each. That gives me the capacity to charge 24 batteries at once. Total cost $171. I will have 32 AAs and 4AAAs in stock. That quantity of AAs will set you back about $108. So total investment is about $280. We spend between $300-500 on disposable batteries per year, so the cost is easily justified. I expect to replace the rechargeable cells in 3-5 years at a cost of another $108. Over 5 years, we come out at least $1,300-1,500 positive. So for me, the initial cost is a complete no-brainer. Here’s how I arrived at the counts. Based on my current testing, I am completely confident that my rechargeable cells will easily get me through Saturday rehearsal and service (about 4.5 hours of power-on time) and Sunday run-through and services (about 5 hours of power-on time). All the NiMh cells I used ran for well over 13 hours in my testing, so even if they lose 50% of capacity over 5 years (which I don’t expect), they will still be working well. Since my 4-year old Ansmann ran almost as long as the new ones, I'm not too worried. So, given our normal usage, up to 8 wireless mics, that makes for 16 cells. A few times a year, we’ll have 12-16 wireless mics on stage, so I spent an extra $57 on a third charger. Really, I don't need it, but for $60, I figured why not. With 32 cells on hand, I can have one complete set in use, and almost one complete set charging at all times, even under our most extreme conditions (I also have another 8-cell charger in our student room that I would appropriate during big productions, so I could charge them all). My strategy for making the switch was to go all in. When I did the math, it is an easy investment. However, if I were going to dip my toe in the water, here's what I would do. 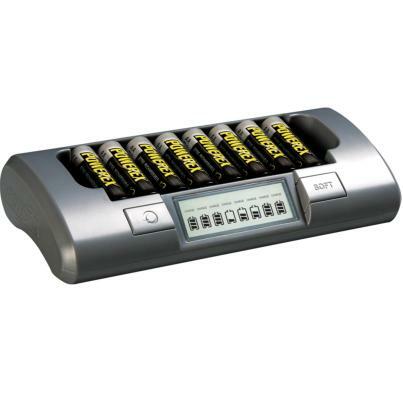 Start with a single 8-bay charger ($57) and 8 batteries ($26). That equals $83 and you're in. Try those batteries on 4 of your wireless mics. Do some tests, find out how long they run. I know the UHF-R are pretty efficient, but I would expect most mics that use AAs to run at least 10 hours on the Powerex, Ansmann or Sanyo 2700 batteries. Because the batteries will easily last through 2-3 services, put them in when you start and charge them when you’re done. Always go straight from charger to mic, and back again. Since you’re charging through the week, use soft-charge mode (500 mAh) and the batteries will last a long, long time. As you get comfortable with them, double your inventory of chargers and cells. With 16 bays of charging and 16 cells, you can run 8 mics all weekend, even if you do Saturday services. That will set you back just over $160 total, and will eliminate the need for almost all disposable batteries in most churches. If you don’t feel you can justify the additional cost for another charger for big events, stock up on some ProCells for that. However, for a big event, you’ll probably spend $40-50 for ProCells anyway, so why not just buy another charger instead? Anymore, the cost of entry is so low, it’s hard to justify not getting started. I was looking back through our battery invoices of the previous 3 years the other day and saw bills for $70, $140, $70, $300, $140 over and over and over again. Since we paid that much for something we threw away, the cost to buy something we can use over and over again is an easy decision. Now, you could spend a lot more money and buy one of Ansmann’s super-cool rack mounted chargers. These babies will charge 16 batteries at once. And they will set you back over $500. Honeslty, I don’t think the cost is justified. I've used those chargers and they're great (except the tabs on the charging trays that don't always lock in, giving you two uncharged batteries). But I can buy a lot of $60 chargers for $500. The Maha MH-C800SAlso, if you look on Thomas Distribution’s website, you’ll see Maha has two models of the 800 series. The MH-C801D model will charge at 1000 mAh or 2000 mAh, which means you could fully charge a 2700 mAh battery in just over an hour. That sounds great, but in reality, we don't need that kind of turnover, and it's a lot tougher on the cell. I go for the MH-C800S model, which is not only cheaper, has a 500 mAh slow charge mode. Because we're only using 50% or so of capacity anyway, it still only takes a few hours to fully charge them; and it's a lot easier on the cell. Easier charging equals longer life. Now, if you use a dozen or two wireless mics every weekend, the initial cost is going to be higher. However, keep in mind you’re spending the money anyway. So again, the way to do it is incrementally. Every time you get ready to place a battery order, instead of sending $100 to Duracell, buy a charger and some NiMh cells. Over a period of a few months, you’ll be fully rechargeable. I used to say it takes a little more work to use rechargeable batteries, but I don’t think it does any more. I put the batteries in and forget about them until we’re done. Pop them into the charger and go home. I won't be changing them between services any longer because I don't need to. And since I'm not trying to stretch ProCells all the way to the end (to try to save money), I don't need to keep a close eye on the battery level meters. So that’s how I would do it. The cost of entry is now so low, it's hard to justify not diving in. And if you really want to do it on the cheap, you could get a 4 cell charger for $25 and spend under $37 to try them out. I have a 4-cell charger that Thomas Distributing gave me for the testing and I'll be using it for my AAA inventory. It soft-charges at 300 mAh which should keep my AAA cells (rated at 1000 mAh) happy for a long time, so you’re investment won’t be wasted. Like I tell people all the time, "It's just math." Do the math and see where you come out. I think you'll find it's not a hard decision.